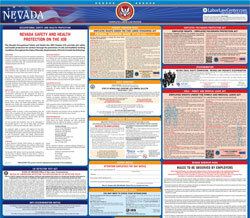 The Rules to be Observed by Employers is a general labor law poster poster by the Nevada Department Of Business and Industry. This is a mandatory posting for all employers in Nevada, and businesses who fail to comply may be subject to fines or sanctions. This poster must be posted in a conspicuous place where all employees will see it. This poster describes all of the requirements employers must follow with respect to conduct with employers regarding firing and quitting employees, wages, tips and uniforms. It appears you don't have a PDF plugin for this browser. Please see the link below to download nevada-rules-to-be-observed-effective-31816.pdf. to hours 	of service, working conditions and compensation therefor. 1. Discharge of employee: Whenever an employer discharges an employee, the wages and compensation earned and unpaid at the time 	of such discharge shall 	become due and payable immediately. 2. Quitt	ing employee: Whenever an employee resigns or quits his employment, the wages and compensation earned and unpaid at the time 	of his resignation or 	quitting must be paid no later than the day on which he would have regularly been paid or 7 days after he res	igns or quits, whichever is earlier. 3. An  employer  shall  not  employ  an  employee  for  a  continuous  period  of  8  hours  without  permitting  the  employee  to  have  a  meal  pe	riod  of  at  least  one	-half 	hour. No period of less than 30 minutes interrupts a continuous	 period of work. 4. Every employer shall authorize and permit covered employees to take rest periods, which, insofar as practicable, shall be in 	the middle of each work period. The duration of the rest periods shall be based on the total hours worked dail	y at the rate of 10 minutes for each 4 hours or major fraction thereof. Authorized rest 	periods shall be counted as hours worked, for which there shall be no deduction from wages. 5. Effective July 1, 2010 each employer shall pay a wage to each employee o	f not less than $7.25 per hour worked if the employer provides health benefits, 	or $8.25 per hour if the employer does not provide health benefits. Offering health benefits means making health insurance av	ailable to the employee for the 	employee  and  the  em	ployee’s  dependents  at  a  total  cost  to  the  employee  for  premiums  of  not  more  than  10 percent  of  the  employee’s  gross  taxable 	income 	from the employer. Tips or gratuities received by employees shall not be credited as being any part of or offset against the	 minimum wage rates. 6. A part of wages or compensation may, if mutually agreed upon by an employee and employer in the contract of employment, consi	st of meals. In no case shall 	 	the  value  of the  meals consumed by such  employee be computed or  valued at  mor	e than 35 cents for  each  breakfast actually consumed, 45 cents for each lunch 	actually consumed, and 70 cents for each dinner actually consumed. 7. An  employer  shall  pay  1  1/2  times  an  employee’s  regular  wage  rate  whenever  an  employee  whose  wage  rate  is  l	ess  than  1  1/2  times  the  minimum  rate 	prescribed pursuant to the Constitution of the State of Nevada: (a) Works more than 40 hours in any scheduled week of work; o	r (b) Works more than 8 hours 	in any workday unless by mutual agreement the employee works a 	scheduled 10 hours per day for 4 calendar days within any scheduled week of work. An  employer  shall  pay  1  1/2  times  an  employee’s  regular  wage  rate  whenever  an  employee  whose  wage  rate  is  1  1/2  times  or  more	 than  the  minimum  rate 	prescribed pursuant to 	the Constitution, works more than 40 hours in any scheduled week of work. The  above  provisions  do  not  apply  to:  (a)  Employees  who  are  not  covered  by  the  minimum  wage  provisions  of  the  Constitution  (b	)  Outside  buyers;  (c) 	Employees  in  a  retail  or  service 	business  if  their  regular  rate  is  more  than  1  ½  times  the  minimum  wage,  and  more  than  half  their  compensation  for  a 	representative  period  comes  from  commissions  on  goods  or  services,  with  the  representative  period  being,  to  the  extent  allowe	d  pursuant  to  f	ederal  law,  not 	less than one month; (d) Employees who are employed in bona fide executive, administrative or professional capacities; (e) Em	ployees covered by collective 	bargaining  agreements  which  provide  otherwise  for  overtime;  (f)  Drivers,  drivers’  hel	pers,  loaders  and  mechanics  for  motor  carriers  subject  to  the  Motor 	Carrier  Act  of  1935,  as  amended;  (g)  Employees  of  a  railroad;  (h)  Employees  of  a  carrier  by  air;  (i)  Drivers  or  drivers’  help	ers  making  local  deliveries  and 	paid  on  a  trip	-rate  basis  or  ot	her  delivery  payment  plan;  (j)  Drivers  of  taxicabs  or  limousines;  (k)  Agricultural  employees;  (l)  Employees  of  business 	enterprises having a gross sales volume of less than $250,000 per year; (m) Any salesman or mechanic primarily engaged in sel	ling or ser	vicing automobiles, 	trucks or farm equipment; and (n) A mechanic or workman for any hours to which the provisions of subsection 3 or 4 of 	NRS 338.02	0 apply. 8. Every  employer  shall  establish  and  maintain  records  of  wages  for  the  benefit  of  his  employees,  showing  for  each  pay  period  th	e  following  information  for 	each employee: (a) Gross wage or salary; (b) Deductions; (c) Net cash wage or salary; (d)	 Total hours employed in the pay period by noting the number of hours 	per day; (e) Date of payment. 9. Wages must be paid semimonthly or more often. 10. Every  employer shall establish and  maintain regular paydays and shall post a notice setting forth th	ose regular paydays in 2 conspicuous  places	. After an 	employer establishes regular paydays and the place of payment, the employer shall not change a regular payday or the place of	 payment unless, not fewer than 	7  days  before  the  change  is  made,  the  employ	er  provides  the  employees  affected  by  the  change  with  written  notice  in  a  manner  that  is calculated  to  provide 	actual notice of the change to each such employee. 11. It is unlawful for any person to take all or part of any tips or gratuities bestowed 	upon his employees. Nothing contained in this section shall be construed to 	prevent such employees from entering into an agreement to divide such tips or gratuities among themselves.